My favorite tie for hats is hands down almost always braid, usually 3 or 4 strands. Braids have more texture but don't stretch out as much. Other projects like ties for sweaters might require a more sophisticated closure, such as garter stitch ties used to hold the front of a sweater closed in place of buttons. Take a bundle of yarn (I use 6 strands or 9 strands depending on the thickness of yarn) twice the length you want the ties to be and pull through the edge of the hat at the edge below the decreases. Divide in to 3 strands and braid tightly. Tie with a knot and trim ends neatly. Done with simply a chain of crochet or with one row of single crochet to make it thicker. Nice and fast, but has a tendency to curl. 2 or 3 stitches are picked up along the edge where you want the tie to be, then use a cable cast to add stitches until desired length, turn and bind off (a stretchy bind off is helpful here). 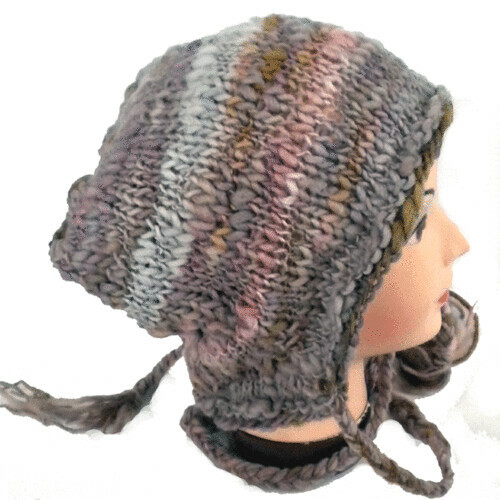 This has the advantage of having both yarn ends to be woven in at the top of the hat. Alternately, use a long tail cast on to cast on desired number of stitches, pick up several edge stitches, then bind off. Icord is probably the most elegant solution, especially for items with an icord border- Elizabeth Zimmerman is great for this. Icord ties can be made over 4 or 5 stitches to make them thicker. The downside of icord is that it tends to be slippery, so bows and knots will not always stay put and sometimes tighten quite tightly, making it hard to undo. Garter stitch's biggest problem is that it stretches out. Easily worked, the idea is the same as the cast on/bind off method, but work several rows back and forth instead, picking up stitches at the edge of the hat every other row as you go along. 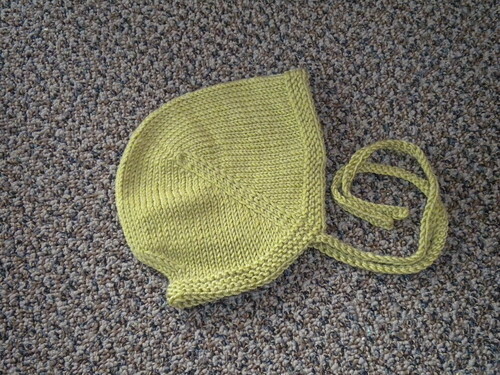 Especially nice if you can knit them in (by casting them on in pattern) while working the garment. Chains are best attached near the back of the work, with stitches picked up the usual way. When looping yarns through from braids or only creating a chain etc it is best to make sure you have gone through several strands of the main object's yarn- preferably two stitches side by side or something similar. This makes it harder for the ties to stretch the edge of a hat out by pulling on one strand too hard. I usually make ties at least as long as the hat, but usually twice as long if they are ties I want to be able to wrap around or tie in a bow. For closures to sweaters and other objects I usually make ties 3-5 inches, depending on how thick they are.